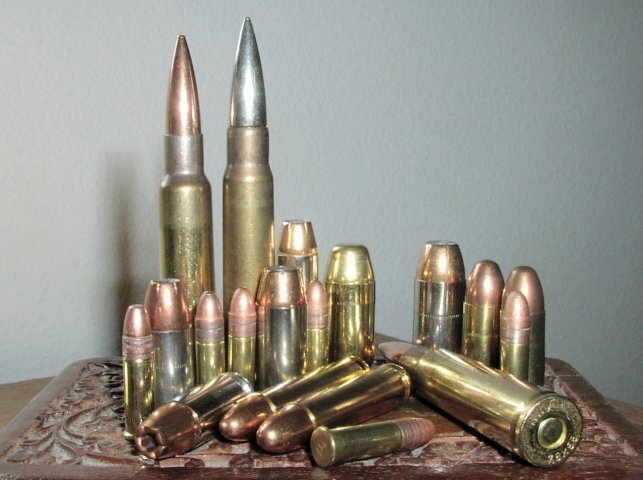 Since the advent of firearms, cartridges have often been described in terms of the caliber of their projectiles, but for modern metallic cartridges, that tells only part of the story. In fact, caliber has become a misleading notion in itself. It is sometimes used to describe the diameter of a bullet and sometimes to describe the diameter of a firearm’s bore, and either of these can vary slightly depending on where the measurement is taken. For example, the .357, .38, and 9mm calibers all refer to cartridges or firearms that employ a bullet measuring .355 inches in diameter. Cartridges are available in a wide variety of shapes, sizes, and loadings. As a firearm loaded with the wrong cartridge is potentially hazardous to the user, ammunition designers and manufacturers have tried to clarify this matter in a number of different ways over the years. Various combinations of the projectile’s diameter with information such as the cartridge’s powder load, year of introduction or adoption, designer’s name, case size or length, and other descriptors have all been used. These designations are also commonly abbreviated. For example, the .30-06 Springfield cartridge fires a .30-caliber bullet, was developed by the U.S. Springfield Armory, and was adopted for military use in A.D. 1906. The metric system probably gives the best approximation. Providing both the bullet diameter and the case length in millimeters, it suggests the cartridge’s possible capabilities. This also makes comparisons of different cartridges somewhat easier, though it is often necessary to convert them to their metric equivalents. For example, the differences between the 9mm Luger (9×19mm) and .45-ACP (11.43×23mm) cartridges are readily apparent when their full metric equivalents are understood. Even metric designations have their limitations. Old black-powder cartridges are usually larger than modern smokeless-powder cartridges, so a modern cartridge derived from an earlier black-powder version may be larger but less powerful than a cartridge of more recent design. For example, the .38 special (9×29mm rimmed) is much longer than the 9×19mm rimless cartridge but generally operates at lower pressures. Ignition systems, propellant speeds, pressure ratings, and bullet or shot types are also characteristics that can be confusing or difficult to determine. Thorough research is imperative for the study of ammunition, but now the correct information is rarely more than a few clicks away.